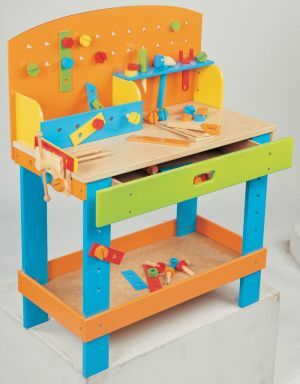 The Wooden Pre-School Workbench is an ideal activity center for children who like to build or construct things. This is also a perfect solution for the little contractor who enjoys copying Dad in the garage. Allow your kid’s imagination to flourish as they use the many bright and colorful wooden tools and parts to create pretend inventions. Ages 3+.